Pressure washer unloaders are critical in allowing your machine to go into bypass mode when the trigger isn't being pressed, thereby preventing an unwanted pressure buildup within the system. Our selection includes a wide assortment of power washer valve replacements to exactly match your machines max psi and GPM output and repair kits to fix broken unloaders. 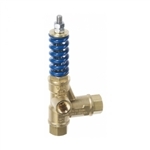 To protect your equipment from damaging heat buildup when it's in bypass mode, a thermal relief valve is called for. You'll find a selection here in 1/4-, 3/8- and 1/2-MPT. Also find jetter valves, pressure relief control valves, water pressure gauges and an assortment of chemical/detergent pickup lines and quick-coupled chemical injector lines.